Turfcare Specialists Limited provide golf clubs with a wide range of on-course equipment such as flag pins, hole cups, litter baskets, and signs form some of the industry’s leading manufacturers. ABS PLASTIC HOLE CUPS– Now moulded in bright white ABS, these hole cups are exceptionally strong. The tapered bottom makes hole changing easy. ANTI-MUD HOLE CUPS – The anti-mud design design keeps the golf ball raised above the bottom of the cup, reducing mud transfer. The solid design also assists in reducing mud from rising up the cup. ALUMINIUM HOLE CUPS – These long lasting hole cups offer excellent shape retention and are supplied in natural or white powder coated finish. Tapered bottom makes hole changing easy. FLAG PINS: Our standard flag pin is a popular D-Ring attachment flag pin manufactured from 12.7mm fibreglass rod and is for use with tie flags and is available with UK or USA Ferrules. Deluxe flag pins are manufactured from 12.7mm fibreglass rod with thick pin tapes for lasting durability, a swivel attachment suitable to hold velcro or tie flags and are available with UK or USA ferrules. BUNKER RAKES – For Members Use. Economy members rakes complete with back smoother and 48 inch PVC handle Great economically priced bunker rakes. Classic White or British Racing Green Polypropylene head. HOLE CUTTERS: Developed in collaboration with greenkeepers to ensure a very strong framework and easy to use design. This hole cutter is also lightweight and comes complete with a moveable indicator to ensure you cut the same depth holes time and time again. Comes complete with a set of blades. Replacement Blades available in standard, reinforced and extra reinforced. DELUXE SPIRAL ACTION BALL WASHER: Cast aluminium body and lid. The body supports a plastic moulding into which the rubber brush and plunger assembly are housed. When pushed up and down, the plunger rotates the golf ball for optimum cleaning.4 litre capacity. Standard colour green. Post not included. SQUARE PATTERN BOOT WIPER: This manual boot wiper is extremely tough and strong. It is phosphated & powder coated green and can be free standing or bolted to the floor. Comes complete with 4 specifically designed brushes. 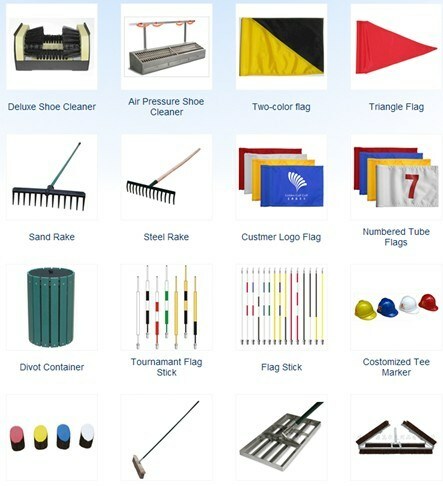 THIS IS ONLY A VERY SMALL SELECTION OF THE WIDE RANGE OF GOLF COURSE EQUIPMENT AVAILABLE FROM LEADING MANUFACTURERS.